WORLD PIANO SUMMIT presents an extraordinary evening of superb solo piano artistry with three world-renowned pianists performing solo in different styles. Luiz Simas (Brazilian), Steve Sandberg (Classical and World Classical) and Armen Donelian (Jazz and Armenian) will feature both known pieces as well as their own original compositions. LUIZ SIMAS is a Rio-born composer/singer/pianist who has been living in New York since 1989. He has led original groups in festivals and clubs in the US, in Europe and in Brazil. Luiz's voice and music have warmed major venues including Birdland, Weill Recital Hall, The Metropolitan Room and The Iridium in New York, Gamle Logen Hall in Oslo, The Pheasantry in London, Philharmonia Hall in Odessa and Sala Cecilia Meireles in Rio de Janeiro. His program includes his own infectious originals and improvisations, as well as his brilliant arrangements of beloved Brazilian music standards by the greatest Brazilian composers. His piano pieces feature new interpretations of several Brazilian genres, such as choro, bossa nova, samba and baião. STEVE SANDBERG is an eclectic musician with a lifetime of experience in many worlds of music. He is a three-time Emmy-nominated composer whose scoring, songwriting and musical direction for Dora The Explorer, Go, Diego, Go! and Dora And Friends helped make these shows the landmarks they are in children’s television worldwide. Steve began classical piano studies at age 4 and won a BMI composers award before attending Yale University, where he majored in musical theory and composition. At Yale, his studies with noted African art theorist Robert Farris Thompson inspired him to immerse himself in the world of Afro-Caribbean music. Upon returning to NYC he played with, arranged and composed for some of the great salsa artists of the 1970s and 1980s, including Celia Cruz, Ruben Blades, and Daniel Ponce (featuring Tito Puente). A highlight of this period was an appearance in Rio and São Paolo opening for the legendary João Gilberto in a duo with vocalist Bebel Gilberto. He also toured with David Byrne (“Rei Momo”) as keyboardist and vocalist. Steve has conducted and arranged on Broadway (Chronicle Of A Death Foretold) and for many regional and Off-Broadway theaters including the New York Shakespeare Festival. He has performed improvised electronic multimedia concerts at the Knitting Factory, The Guggenheim Museum, Le Petit Versailles, and the Stone, featuring his unique voice on the breath-controlled Yamaha VL70 synthesizer. These concerts were heavily influenced by his studies of North Indian raga singing. Steve’s latest project is the Steve Sandberg Quartet. Their concerts begin with performances from the classical solo piano repertoire and continue with their soaring improvisations on originals that draw from European, African, Latin, Balkan and Indian traditions. As a teenager, ARMEN DONELIAN was mentored in Jazz by guitarist Arthur Ryerson, Sr. who played with Louis Armstrong, Paul Whiteman and Jack Teagarden. A graduate of The Westchester Conservatory of Music and Columbia University, Armen also studied privately with Michael Pollon (piano), Carl Bamberger (conducting), Ludmila Ulehla (harmonic analysis), Harold Seletsky (Schoenberg theory and counterpoint) and Richie Beirach (jazz piano) and traveled to 25 countries. 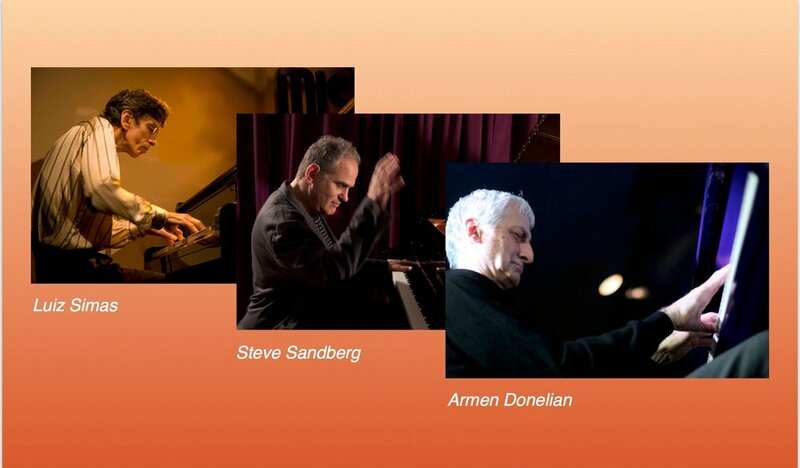 Armen has performed and recorded since 1975 as a featured solo pianist, bandleader and with Jazz legends including Sonny Rollins, Chet Baker, Paquito D’Rivera, Mongo Santamaria, David Liebman and Billy Harper. Armen has appeared in numerous major international concert and club venues. A composer of 100 works, he has produced thirteen acclaimed recordings for the Sunnyside, Playscape, Odin and Atlas labels. His 2014 release, Sayat-Nova: Songs Of My Ancestors (Sunnyside), is a two-CD set of solo piano and trio vignettes with bassist David Clark and drummer George Schuller. In it, he transforms the priceless Armenian folk songs of 18th Century troubadour Sayat-Nova through the lens of his contemporary Jazz mastery, offering “Countless exquisite moments” (Downbeat). These piano arrangements are published in Sayat-Nova: Ancestral Songs (Edition Gruber). Armen is a 6-time Jazz Performance Fellow of the National Endowment for the Arts, and a Fulbright Senior Scholar and Specialist in Armenia, Finland, Greece, Sweden and Switzerland. A faculty member at New School Jazz (1986-present) and William Paterson University (1993-2016), Armen has lectured at many top schools throughout the world. Armen’s books Training the Ear, a two-volume book/CD set, and Whole Notes: A Piano Masterclass are published by Schott Music. Visit project142.org to donate or view concert calendar.